When you do events with Pedal Power, especially with groups of pedalers, it’s good to have a simple, comfortable bike that looks inviting and leaves no option but to get on and pedal. The Generator Pro is that bike. It has no gears, no brakes — only the seat to adjust. The handlebars don’t even turn. Nothing rubs the tire, nothing gets hot, and no parts wear out when people pedal for hours on end at events. What it does have is a large and effective brushless generator wheel. 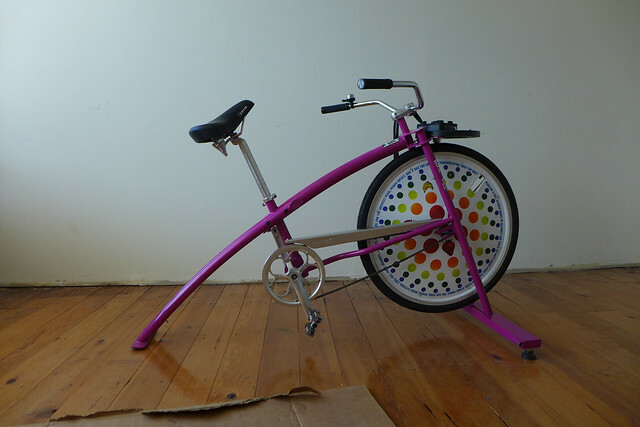 The size of it creates a flywheel effect that smooths out people’s pedal strokes. The magnets and coils inside the hub never touch each other. The power comes through a cable at the center of the wheel. The hub is rated for more power than even the strongest Tour de France riders can summon. The frame of the bike has a very wide size range. You’ll see 7-year-olds high-fiving adults as they pedal alongside each other. 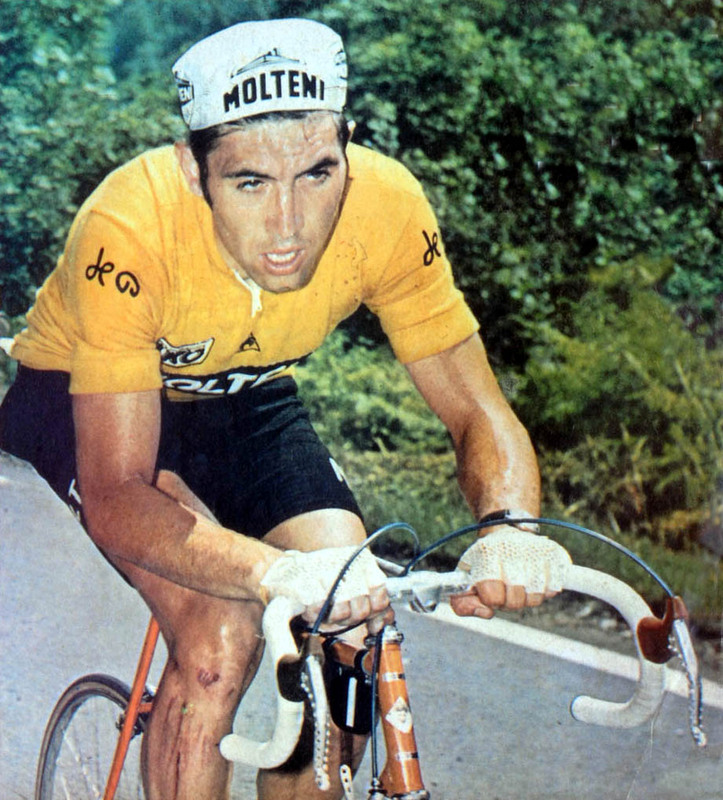 All you have to do is make sure the seat is adjusted for each rider. 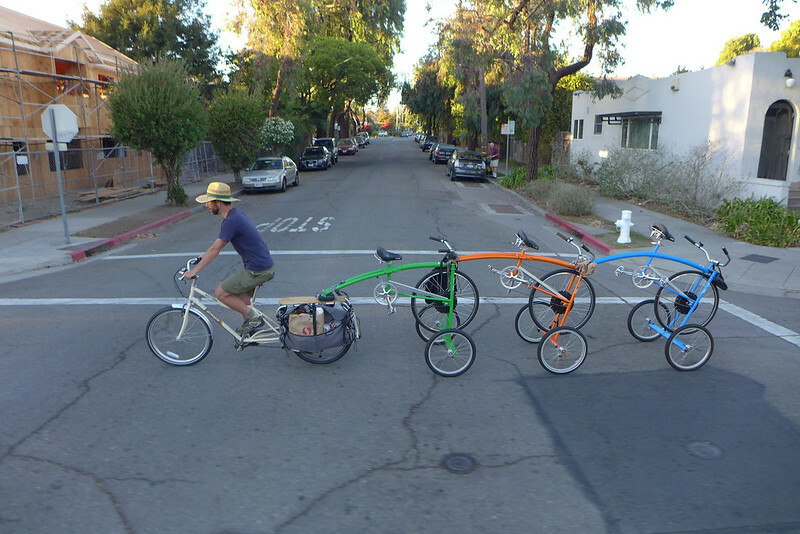 The ease, comfort, and fun of people pedaling in groups are what this bike was designed for. 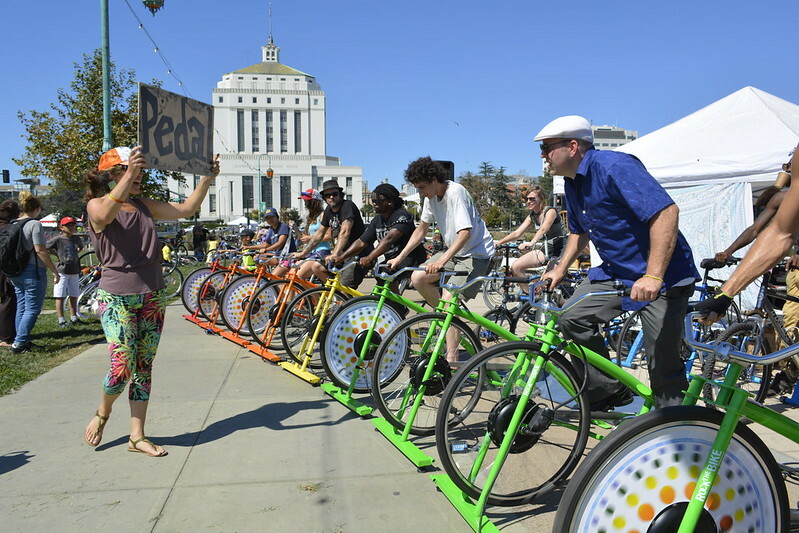 Above: 18 Generator Pros in use at our Pedal Powered Stage at PedalFest in Oakland’s Jack London Square, an event benefiting our local bike advocacy org Bike East Bay. Please note: Wheelcovers are not a standard feature but are available as an option with your purchase. This generator is for customers who want the best, like the way it looks in a group, and desire the benefits of its simplicity. The lack of unnecessary features in this high-performance generator allows your staff to direct their attention to other things at your events, like people! Watch this video and see all the different ways the Generator Pro was used at PoliticalFest2016 at the Democratic National Convention. -Compatible with any Rock The Bike electrical activity, such as the Recharge Station, the sLEDgehammer, the Utility Box. -Consistent performance thanks to its large flywheel-grade generator hub. -Cruise-y looking and comfy. Looks great as a group at events. -Powerful gear ratio. Those who want to crank won’t be disappointed. -Uses the same frame as our Fender Blender Pro — with the same wide size range. You can add that activity later. -Can be branded — see our examples. -The Generator Pro is not a complete activity by itself. You must match it to one of Rock The Bike’s compatible Electrical Activities, which each have their own level of difficulty. For example, if you want usable AC power, you’ll want to match up the Generator Pro to the Pedal Power Utility Box. If you pedal the Gen Pro on its own with no matching circuit, it will have no resistance and the wheel will just spin faster and faster. -Voltage output is nominally 24, but will be pegged to the load you connect. It will work best with 24V systems (all of Rock The Bike’s systems are 24V systems). -A 20′ Rectifier Cable is included, terminating in a Neutrik NL-2 connector. Without the Rectifier Cable you won’t have usable DC power but 3-phase AC power. If you want a different connector or bare wires at the end of your Rectifier Cable, please let us know at the time of your order and we’ll do our best to accommodate your needs. A common alternative to the Neutrik NL-2 in the Pedal Power world is the Anderson Powerpole connector, which we can easily substitute upon request. We’ve made a handy-dandy guide to help you navigate our electrical activities. What can I power with Rock The Bike Generators? What can I power with a Generator Pro or Electric Fender Blender Pro? Smart LED pedalometer (shows up to 5 people how hard to pedal. Bigger groups can plug in our Tube Pedalometer). USB Only: Our Cell Recharge Circuit and Cell Phone Recharge Desk both are capable of charging up to 8 devices at once. LEDs (dumb): This low-cost activity is also fun and beautiful when done artfully. Wire 12V flexible LEDs in 24V series, 36V series, or 48V series or any combination of the above. When used in combination, the lower voltage lights turn on first, and the higher voltage LEDs will light only when you pedal fast enough. To prevent overvoltage conditions from damaging the lights, you have to use enough of them that the pedalers are sufficiently tired out trying to keep them on. The rule of thumb is that these lights consume about 1W per foot. Depending on the age group of your event / school / setting, your pedalers may be able to create up to 200-400W of power. If you want to challenge them and keep your LEDs cool, you may have to use that many feet of LED. If you choose 36 or 48V series wiring, this is less of a concern. Measure with a voltmeter and try to keep the LEDs under 150% of their rated voltage, especially for extended periods of time (more than a few seconds). You can also reduce the voltage spikes that the LEDs see by pairing them with a capacitor. Ask about our LED kits! In terms of the above list, what’s the difference between a Roll Up, Generator Wheel, Electric Fender Blender Pro and Generator Pro? The main difference is the Roll Up and Generator Wheel are capable of working well with 12v systems. The Electric Fender Blender Pro and the Generator Pro can technically be used with 12v systems, but the gearing will likely feel too hard. The Electric Fender Blender Pro and the Generator Pro are best suited to 24V systems. Old and new Fender Blender Pro seatposts. If your old one is causing your seat to slip back, we want to get you a new one. 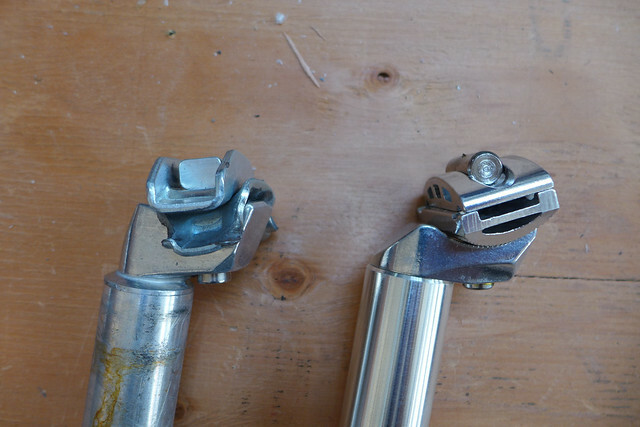 Old seatpost on left doesn’t hold angles well. The seat should be flat, not pointing up like this. 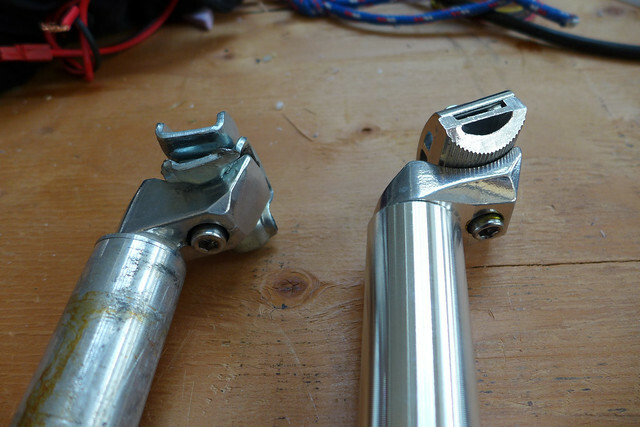 The new seatpost (on right) has better grip on angles. To take advantage of this offer, call us at 888-354-BIKE (2453) or email us through the contact page. 3000-person Pedal Powered concert system fits in briefcase. Rock The Bike's biggest custom build to date. 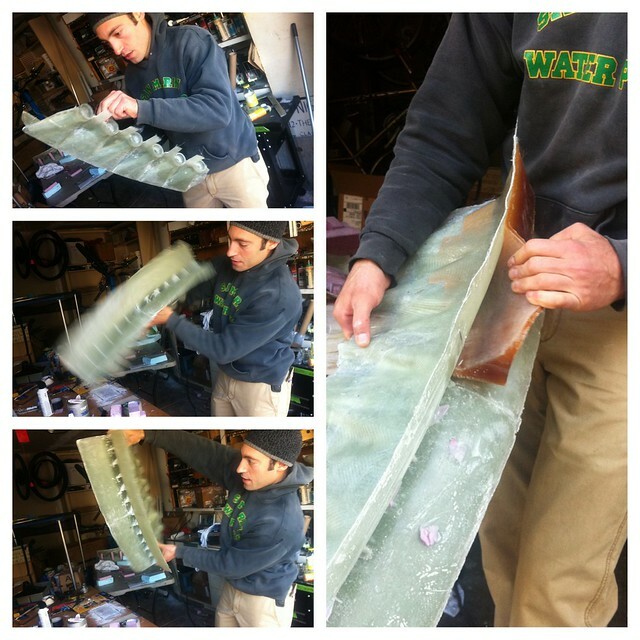 Demolding wave guides. Each of the slots is at a slightly different angle, allowing the 6 tweeters to reach different parts of the crowd. Photo: Mike Cobb. 1/9/15 Update! The Russian Dolls / BRX system is in use! Check out the photos and blog post about the 9/21/14 People’s Climate Rally in Oakland. It’s always exciting when you move from the brainstorming and drawing phases of a custom project into the hands-on, smelly, goopy, dusty build phase. That’s happening right now for a project that could hopefully have a big impact on how we do our largest Pedal Powered concerts. It doesn’t have a concise name at the moment, so I’ll call it the 3000-person Pedal Powered Concert System that Fits into a Briefcase. Another name I’m considering is “America’s Concert” in honor of the AC72 America’s Cup boats that partially inspired it. 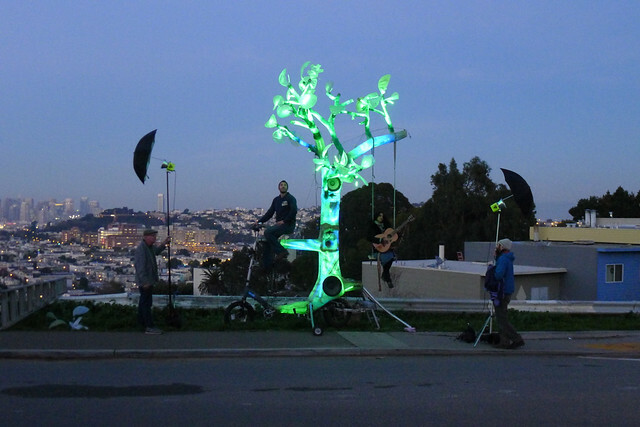 It’s also inspired by Fukishima & Global Warming, Bike Party, James Bond, and Rube Goldberg. It’s a new way to reduce the volume and weight of our 12-speaker concert PA system, using ultralight materials and a stacking / nesting / Russian Dolls redesign of the loudspeaker cabinets. 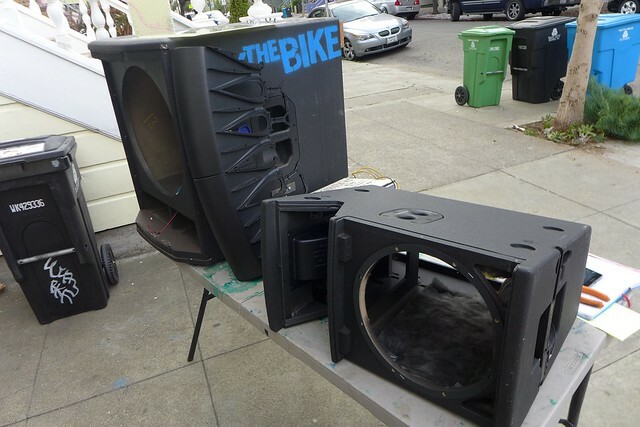 Loudspeakers contain lots of air. Air is what allows them to reproduce low frequencies like bass notes and the beat of dance music. But it means that they take up lots of space.